In my Junior year at the Academy of Finance and Enterprise, I decided to enter the PENCIL Fellows Program, in which high school students in New York City get placed as summer interns in local businesses. To get into PENCIL, I had to work hard by attending events, going to interviews, and writing an essay that would convince PENCIL that I was capable of working hard this summer. Through PENCIL, I was placed at Kinvolved, which is an education technology startup that has created an application to help teachers take attendance and increase communication with parents. When I started working with Kinvolved, I was assigned to do a project to learn more about what students think of school. So, I created a survey and sent it to high school students in New York City via email, Facebook, and Twitter. As a result, I got more than 90 survey responses, and some of the students that answered wanted to be featured in my interview. Later on I invited them over to Kinvolved’s office for an interview so I could make a short documentary on Kinvolved and on the students’ opinions on attendance. The results of my survey were very interesting. Most students know the importance of being in school, but what prevents them from attending more frequently are family-related issues. Perhaps the student does not have good communication with their parent or guardian. This is a struggle for them because everyone needs someone to be there for them, and if not they could end up going down the wrong path in life because they believe that no one cares about how they do in school. The truth is that they do care, but sometimes the parents or guardian do not know how to communicate with or help their child and their teachers fix their problems. According to the survey, 70% of kids are late to school, which is a very large problem that needs to be solved. Another important thing that came up in the survey was the lack of communication between teachers and parents. While these are big problems, it great to know that Kinvolved offers an app and support to help solve them. 70% of student reported they were late to school. 48% of students reported their teachers shared positive things with the students’ parent(s). 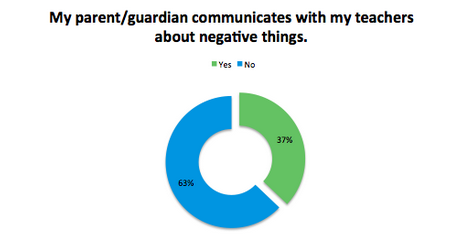 65% of students reported their teachers shared negative things with the student’s parent(s). As a high school student, it was a great experience for me to understand the experience of working in an office. At Kinvolved, I met a group of wonderful people that is working hard to develop an application that will help the community. They taught me to work in a group by calling team meetings and discussing the problems in the workplace and giving solutions to those problems. Kinvolved, also, taught me how to use many computer programs such as Excel, Powerpoint, iMovie, and so much more. 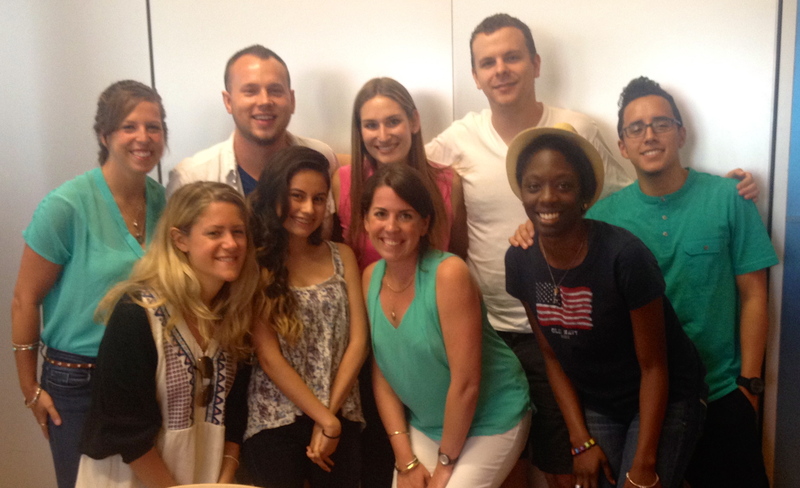 Maria is seen here with the summer team! On top of learning about the work environment, I learned more about public schools in NYC. I wasn’t aware of how much attendance means. I was aware that attendance is important, but I didn’t know how much students are absent each year and how that absence can affect them in the long run. Kinvolved is really going to help make a difference with attendance by helping parents and teachers communicate with each other to help solve the problem. Now more students will be attending school for the better. In conclusion, I couldn’t have asked for a better place to intern in because they taught me the values of work and the importance of school. About Maria: Maria Armijos is a high school senior at the High School for Finance and Enterprise in Long Island City, NY. Maria interned with Kinvolved as PENCIL Fellow this summer. She helped us learn more from the students we serve, and gave us an inside perspective on what it is like to be a junior or senior in school, with big goals and ambitions. Learn what students think about school, their mentors, and what their teachers would describe them in one word. Thank you, Maria, for your hard work!